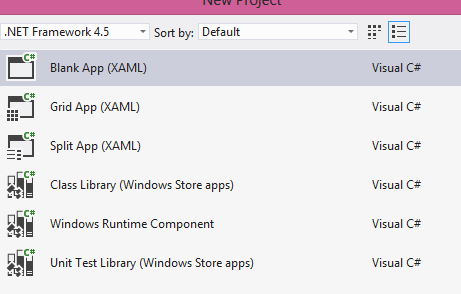 Windows Runtime (WinRT) is used to make Windows store applications. The problem is that the WinRT API is designed in a way that Views and ViewModels are tightly coupled. This means that all the business logic, events like button click, are in “code-behind” of the view instead of it being in the view model. This Framework allows us to enforce a solid MVVM pattern that puts all the business logic in the view model making it decoupled from the view. Before we make use of the functionalities of the framework, we need to make sure that it is referenced correctly in our project. We need the App to inherit from DefaultApplication. 5) Now, we need to add a new class called MainPageVM.cs. This will become the view model of our MainPage View. 6a) IsSearchSupported tells the Framework if we support search or not..
6b) Next we need to provide the framework with an adapter to our IoC Container, which will allow the framework to create instances from our ViewModels Types. If you use your own IoC Container (such as Autofac or Prism), you should develop an IoCAdapter by implementing the IoCAdapter Interface. If, however, your project does not use an IoC Container, you can use the framework’s DefaultIoCAdapter, which is a very simplistic IoC Container implementation that uses types’ default constructors to create their instances. 6d) Lastly, we want to tell the framework what page we want to navigate to. We achieve this by specifying in the Navigate() method what ViewModel of the page that we want to navigate to. This means that if we want to navigate to the MainPage View, we need to specify its view-model to the Navigate method like this — Navigate<MainPageVM>().